Ahoy there me lads and lasses. It’s me again yer friendly app pirate ready to share with ye another app review. But afore that let me tell ye about the snowboarding adventure that me had with the crew. Me parrot pet enjoyed it too. We decided to have a quick break and have fun when we passed on this snowy mountain. We sure had a great time and we are planning to go back for more. Since I’m still not over the excitement of our snowboarding adventure, the app that I will share with ye me hearties has something to do about that. 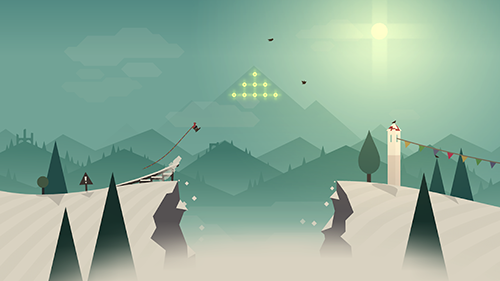 ‘Tis called Alto’s Adventure by Noodlecake Studios Inc.
One of the things that is typical on most endless runner type of games is that they have the same background that can get quickly boring especially if you will playing the game for a long time. 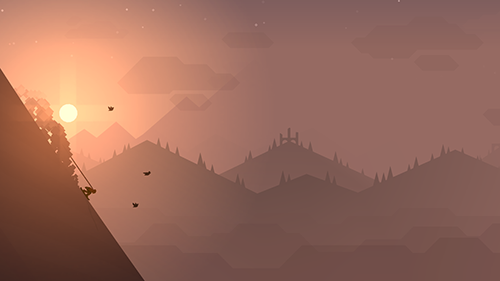 Although the background of Alto’s Adventure also repeats, there are variations such as the things you will see and the changing weather, so it is not as repetitive as the other similar apps. The time also changes from day to night. There is a tutorial at the beginning of the game so you will know what to do right away. The controls are also very simple so you will not have a hard time familiarizing yourself. You only have to tap to jump and tap and hold to do a back flip. Although the basic gameplay is easy to understand, this doesn’t mean that the game is without any challenge. It is still challenging especially there are various obstacles that you will face just like if you are snowboarding in real life. While this is a play as long as you can to get to the farthest distance possible kind of game, you will still have a sense of achievement passing each level because there are certain goals that you need to complete in order to move to the next level. For instance, you will be given the number of llamas that you need to collect and the minimum distance that you should reach. The app has changing background, weather and time, which prevents it from easily getting repetitive and boring. It also has a tutorial in the beginning so you don’t have to figure out how to actually play it. The controls are also easy to learn, but the game is still challenging enough to keep you going. The only problem is that the advertisements can be too much. Ads appear after every run and there are others that cannot be closed, and those that lead you to the store to make a purchase. This can be annoying in the long run. Aside from the issue with the advertisements, Alto’s Adventure is overall a nice game to try. This is ideal for those who love snowboarding, endless runner games that come with objectives that need to be met.